This is probably one of my personal favourite recipes from The Fry Family Food Co – simple, tasty and looks incredible too! 2 Granny Smith Apples, sliced into matchsticks (soak in lemon water to prevent browning). Heat the olive oil and gently fry the onions until soft. Add the garlic and smoked paprika and stir to combine. Add all the rest of the ingredients and allow to simmer uncovered over low heat for 15-20 minutes. Remove from the heat and set aside until ready to use. Store extra BBQ sauce in a sterilised, sealed glass jar. Toss the apple sticks, shredded cabbage and sprouts together. Season and drizzle with mayo. Slice the Fry’s Vegan Polony into rounds about 2 mm thick, then slice into thin matchstick-style pieces. Toss the polony sticks in the heated BBQ sauce to coat. Slice the ciabatta into 8 thick slices and brush with olive oil. Braai the ciabatta slices until grilled and golden. 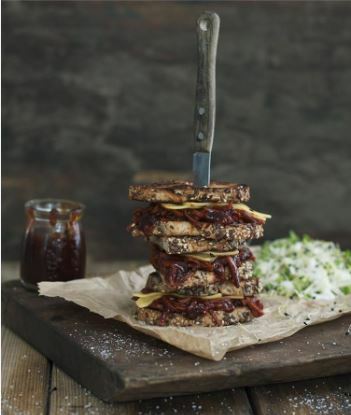 Assemble your sarmies with the BBQ sauce coated Polony and slices of vegan cheese. 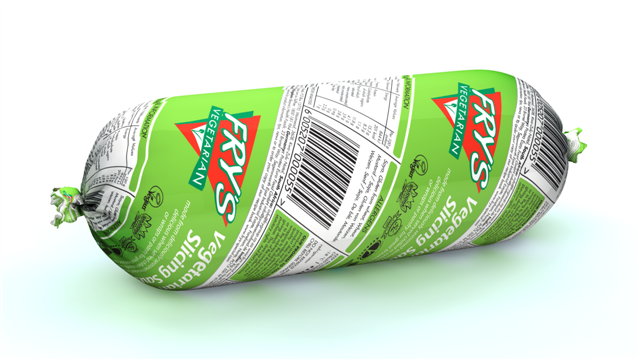 AUSTRALIA…good news – the Polony is now available from the list of independent stockists on this list! Hi there loved reading all your recipes – can I find the Bolognese one anywhere? It was mentioned on the News24 article. Thanks! HI Cheryl, its pretty simple – saute 1 onion, add 1 tin chopped tomatoes, add 1 grated carrot, chop Fry’s Mince a little smaller and add to onion and tomato mix, add 1 cup roughly chopped walnuts. Add 2 tbsp Chutney. That’s it!